The natural sweet briny flavour of an oyster is one of the oceans great treats. On Prince Edward Island they’re a culinary treasure and always enjoyed on-the-half-shell. Our shuckers prefer toppings that complement and enhance the oyster, not hide or overwhelm its delicate texture. In my oyster bar at The Inn at Bay Fortune this chilly condiment is a favourite. 1. Make the granita a day or two before the party. Squeeze and drain the juice from the tomatoes into a small saucepan. Toss the tomatoes into the blender. Add the wine, sugar, and spice to the juice then bring the works to a full furious boil. Stir frequently and continue cooking until the volume reduces by half or so, about 5 minutes. 2. Meanwhile add the hot sauce, lemon juice and zest to the canned tomatoes. Pour in the spiced infused tomato juice scraping in every last drop. Carefully puree the works smooth. Pour into a pair of mason jars. Cap loosely and place in freezer. Every hour or so tighten the lids and shake the jars vigorously until frozen smooth. Freeze overnight. You can store the ice for months in the freezer and always have some ready for a few oysters. 3. When the party begins gather your fellow shuckers and carefully shuck the oysters keeping all your fingers and the liquor in the shell. 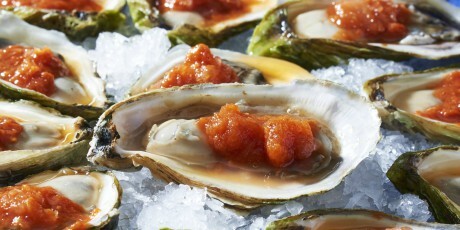 As you shuck use the upside down tops to help you steady the oysters so not a single precious drop of flavour is lost. 4. At the last second – so it doesn’t melt – scrape and place a dollop of ice onto each oyster. You can shuck and share all the oysters at once or serve one-at-a-time. Either way enjoy the party! Oysters are quite edible year round but lose flavour when they spawn in warm summer waters. The tastiest ones tend to come from the coldest Northern waters. Inside the shell are two basic parts, the oyster meat and a small scallop shaped muscle that firmly holds the top and bottom shells together, it is the strength of this muscle that must be overcome. To ease the shucking process hold the oyster flatter side up in one hand protected with a folded napkin. Insert the oyster knife into the hinge near the narrow end. Twist don’t pry. Think of the tip as a key-in-the-lock not a lever. Hold the shell and slide your knife along the underside of the top cutting through the top of the tough hinge muscle. Flip the top shell over as a balance point. Scrape your blade under the same muscle, check for debris, serve and share!